On Monday, June 26, 2000, four of us rode the Waganupa: my brothers, Michael and Patrick; Patrick's wife, Vivian; and me, Timothy. Also along were Ray and Jeff. They are not pictured here because they repeatedly rode on ahead of us. The first page of this ride report contains the whole, fascinating account of the ride with all the bloody details. Read it or gloss over it and head straight for the pictures that start on Page 2. 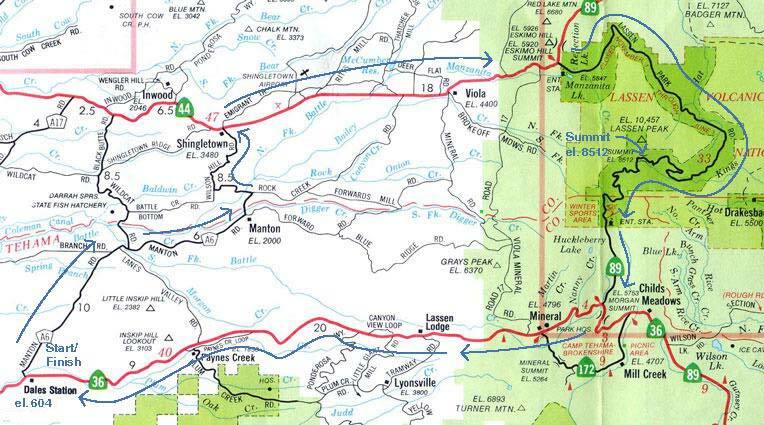 The Waganupa is a loop that starts at Dales Station, just outside of Red Bluff, CA, and goes northwest to Lassen Volcanic National Park, up over Lassen pass and back to Dales station. To see at a map of the course, click here. The photographs shown here were mostly taken with BikeCam™, a throw-away camera velcro-attached to a platform wired onto my handle bars. Michael also brought his digital camera along and captured some wonderful shots. Not had enough? Visit my chronicle of last year's ride Waganupa 1999. it provides a more complete account of the ride.